You may or may not remember how much we love The Marksman. We’ve only mentioned it several times. We have an excuse for bringing it back up – the menu has grown, a new chef is in residence, and we can. Because it’s our website. This Sunday we were accompanied by two lovely ladies, Emily and Lauren. Lauren assured me that the Bloody Mary is the best she has ever had. And the presentation delivered on its promise. Drew and I enjoyed omelets from the brunch menu. I had no idea what David was talking about last time when he said that breakfast and beer were good company for one another, but I think I understand now. When breakfast is eaten in the afternoon, it does make sense – whether or not there was a bender the night before. David also recommended the Chocolate Fondant. (It’s what some of you Americans might call a molten cake with a side of cream whipped so long it’s the consistency of butter.) Order it. Trust me. I could not get a photo before the spoons starting flying! Both of the owners stopped by to say hello – and we heard the good news that their daughter will soon be a big sister! I am not sure I could love them more. And I barely know them… It’s just so nice to feel at home. 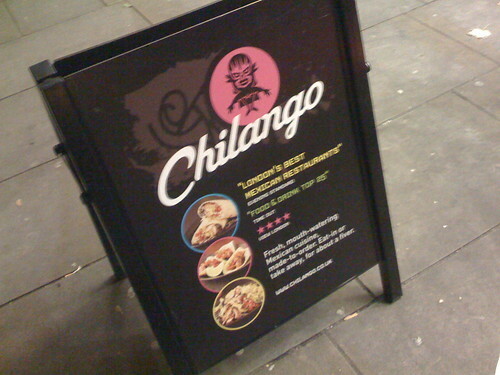 Posted on 16 November 2009 17 November 2009 Author JenCategories Food & DrinkTags columbia road flower market, Hackney Road, Local Pub, Shoreditch, Sunday Roast, the marksman3 Comments on Oh. My. Marksman. Exmouth Market is a funky little pedestrianized street lined with 23 restaurants and little shops peppered in. Drew and I enjoyed a lazy Saturday lunch at Sofra this past weekend. I think it may have been my first taste of Turkish food; this restaurant is quite veg friendly, by the way. 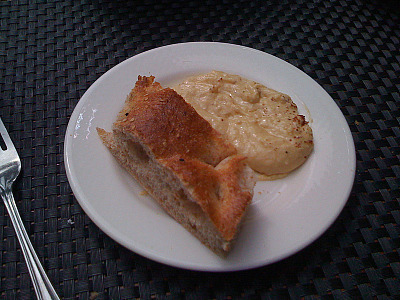 Our hummus starter was served with a yummy bread. 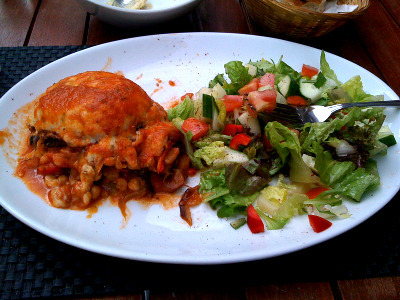 We could have split this Vegetarian Moussaka! 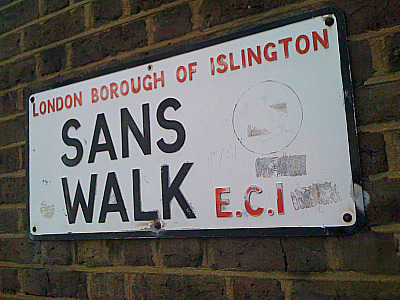 After such an explosion of calories in our stomachs, we wandered home the long way, via Sans Walk, even. Hilarious. Ah, the irony coincidence. Inamo is a surprisingly well kept secret, conveniently located on Wardour Street in Soho. Serving pan-asian fusion cuisine ordered via an interactive projection on each table, this funky restaurant has great service, lovely food at a good value, and a chill atmosphere. This novel dining concept makes a meal quite entertaining. One of our B&B guests suggested Inamo and we are so glad they did. Thanks Pinky, for being in the know. Watch the chefs in the kitchen if you fancy that kind of thing. Take photos. Laugh. Play games (yes, there are games so you can ignore your friends. Ah, technology!). He’s not on the menu, ladies. But he’s just what I ordered. 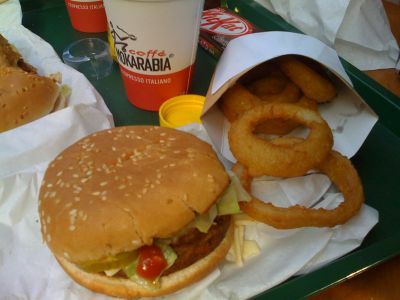 It was our experience that the wait staff will most definitely make recommendations and tend to be quite knowledgeable. They will help you choose complimentary food and beverage (and make minor adjustments to your drink if they aren’t sure it’s perfect). I appreciate Inamo for the novelty, the artistry and quality of the food, the value, the service, as well as the great location. It’s terribly convenient for site-seeing or dining in the theatre district. Book a table, though. We aren’t the only ones who know this secret! You can probably create thousands of combinations mixing the toppings and sauces, but you might be amused by one of the geographically inspired items on the menu. I think the novelty of the oven and the pizza names may have been a little more special than the pizza actually was, but it was still quite good. 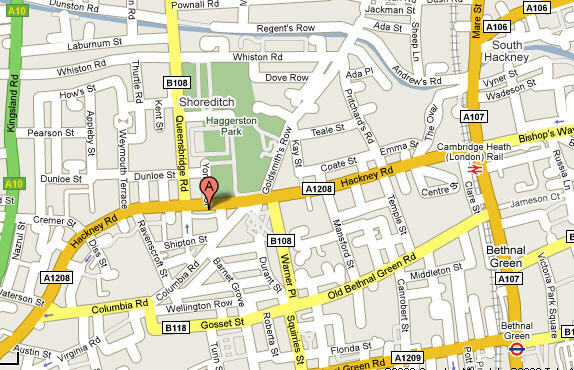 It’s a nice place to eat a pizza and enjoy company just off the busy streets of Covent Garden. There has been one good thing to come out of our short, nasty stint with Barclay’s bank; across the street from a branch I have visited several times there is a restaurant that caught my eye. Hummus Bros. is a laid back little joint where you are seated family style for the pleasure of simple food made really well. The hummus is one flavor suits all, but you choose your topping. Your topping then becomes a mix-in, depending on your hummus eating style, of course! 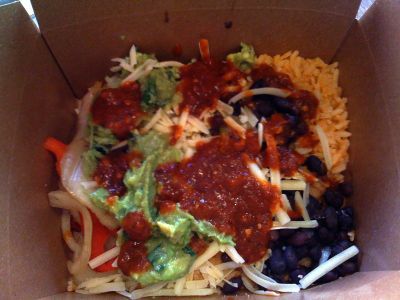 Special toppings are featured regularly so that you never tire of trying new combinations. Drew tried the mushroom topping and mine was guacamole. Thumbs up for both! 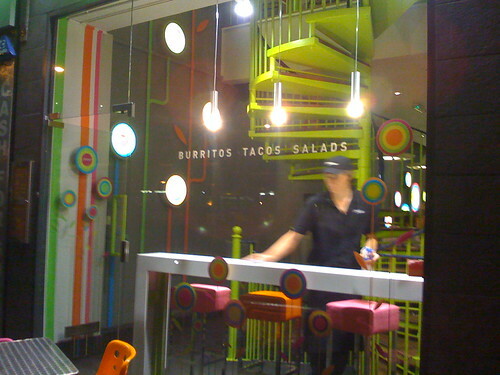 Posted on 8 May 2009 9 May 2009 Author JenCategories Food & Drink1 Comment on Hummus Bros.
Festive, fun, lively… Green and Red of Shoreditch serves freshly prepared Tex Mex and more brands of Tequila than I can bare to even look at. Drew and I shared stories and a pitcher of margaritas with a new friend over dinner at what is one of her favorite restaurants. (She is seemed to be well known by the staff and has even pledged to join the Tequila Club when it starts again in June.) I had a wonderful trio of chayote, pumpkin, and chillies. Bookings are recommended, but the atmosphere is great for a party or group. There is a restaurant on the ground floor and a club downstairs that hosts djs and other performance artists for late night hanging. It was a little dark for photos, but I did my best. 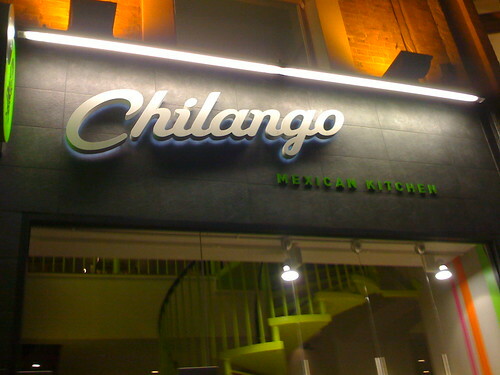 Who knew – Tex Mex in London? If you can’t find enough green space for your alfresco itch, look up. Several London roof top bars boast beautiful views and great atmosphere to go with the drink. One such rooftop bar and restaurant happens to be in my neighborhood. Coq d’Argent is a lovely place for an after work drink or a ambient dinner. The plates are a bit on the expensive side, but for business dinners or special occasions, that might be just the ticket. Restaurant reviews are mixed, but the bar is great way to start or end a night with friends, even if you just get a Diet Coke. You might have to wait in the queue to use the lift unless you have reservations for a table, but the wait isn’t long. Once you are on the roof, enjoy the view and the well dressed crowd. The view at sunset is nice, but it can get a bit windy so bring a light jacket or wrap. Sometimes I just want a burger and fries. 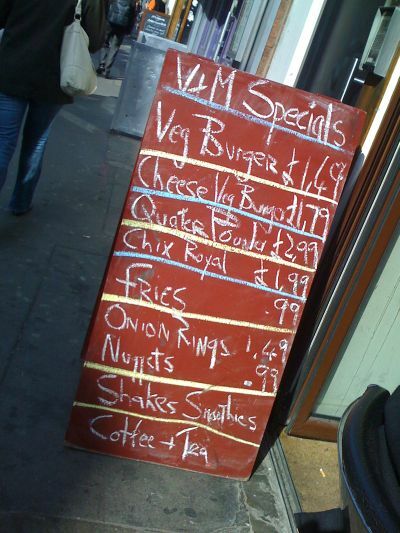 Today, Drew introduced me to a cheap vegetarian meal deal at V & M Express, on Greek Street in Soho. You can get a Quarter Pounder, side item, and a vegan shake for £4.99. 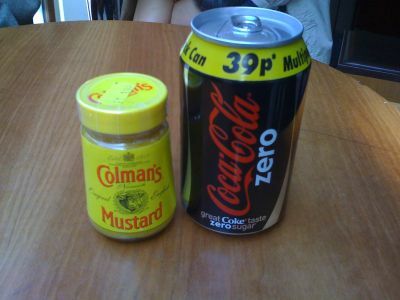 (Unfortunately, Drew had to slip next door to get me some mustard and caffeine. V & M was short staffed and under supplied due to some unfortunate , and seemingly random, circumstances…) Go easy on the Colman’s – it is known to burn holes through the roof of your mouth to the back of your head. If you find yourself near the Seven Dials end of Covent Garden with a wicked craving for a curry, we recommend Thai Square. 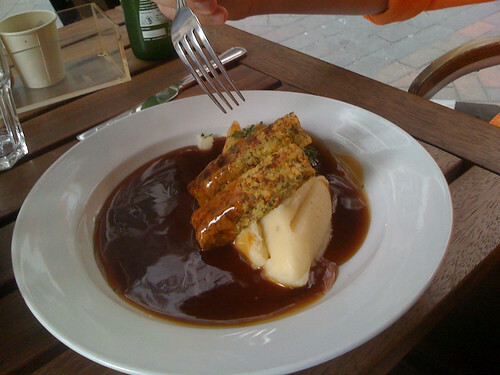 Ready made food is all the rage in the big, busy city. Although I would like to learn to make my own meals from scratch, I am excited to try Loyd Grossman’s line of sauces. Eventually I will learn what we like and how to make it at home. For now, though, we’ll stick to the adventure in a jar.